Expansion of the existing riparian buffer in ZONE A is a BMP which will slow, reduce, clean, and infiltrate stormwater from the extensive impervious, upslope parking area. In addition to intercepting stormwater, expansion of the existing riparian buffer will increase wildlife value, as an increase in native plants will supply many birds and insects with food sources and shelter. 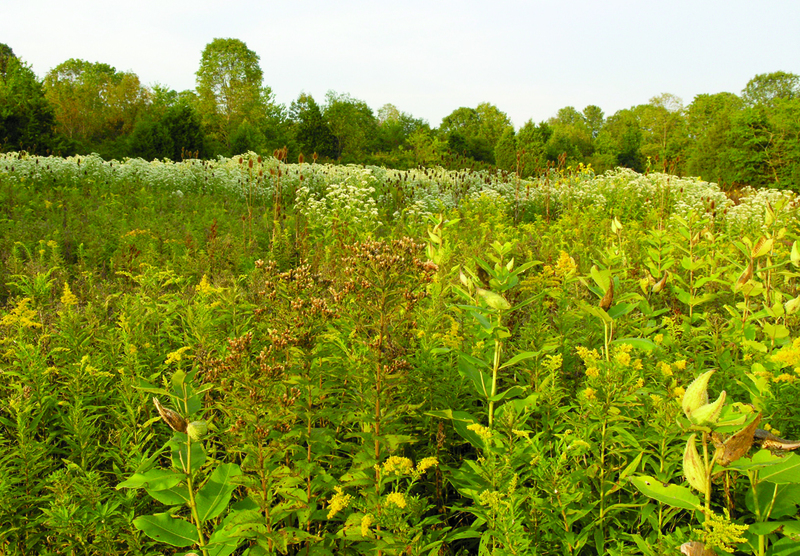 Before planting the riparian buffer, an invasive plant management plan should be implemented to eradicate the most pernicious weeds. Suggested target species for elimination include Japanese Honeysuckle, Multiflora Rose, Loosestrife, and Autumn Olive. Techniques for removing these plants are listed on page 31. If a completely unobstructed view of the lake along ZONE A is desired, planting trees may not be possible in this area. However, maintaining this area as low shrubbery will be more time consuming and expensive, requiring continual removal of volunteer tree seedlings. If, instead, particular points along the bank are planted with canopy trees which can be limbed up, maintenance requirements will be reduced, the plant community will look and function more naturally, biodiversity will increase, and a view to the lake will endure. Due to deer pressure and environmental factors, a 70% to 80% survival rate of riparian plants should be expected in the first year. After the first year, established plants will begin to colonize and grow more rapidly. Dense coverage of the riparian buffer should occur between the third and fifth year, depending on the level of pressure. Success of this area can be measured by use of transects and photo documentation. Transects provide a record of plant size and location for distinct areas, while photography allows for an overall comparison of the entire area from year to year. The Juniper grove, indicated on the map as ZONE D, consists primarily of Eastern Red Cedar, native evergreen trees with high wildlife value. The lower limbs of these trees are high enough for visibility to the lake. Invasive plants which once overtook the understory of the Cedar grove have recently been removed. However, pervasive weeds such as Poison Ivy and Autumn Olive will require ongoing removal efforts. Any understory plants selected for this area must be shade tolerant, drought tolerant, and capable of withstanding periodic soil saturation. These native grasses are well suited for dry to mesic and shaded to sunny sites. Pennsylvania Sedge and Appalachain Sedge are the lowest grasses, reaching 18” and forming low dense turf-like colonies. Because seed for these grasses is not available in the trade, establishment relies on plug planting which is more expensive and labor intensive. The most cost effective method of establishing a low vegetative cover is seed broadcast of a mixture of the other native grasses which reach a height of 3 feet. The least expensive grass seed alternative is use of multiple native Wild Ryes. These grasses are considered short lived perennials, but they will persist longer in shaded areas. Early Spring: Apply Rodeo® to invasives. Seed area with a cover crop (annual rye) or cover area with wood chips to prevent erosion. Wood chips should be from trees without alleleopathic properties (Norway Maple, Acer platanoides). Fall: Reapply Rodeo® to newly emerging invasives. Fall: Seed area with native grasses. 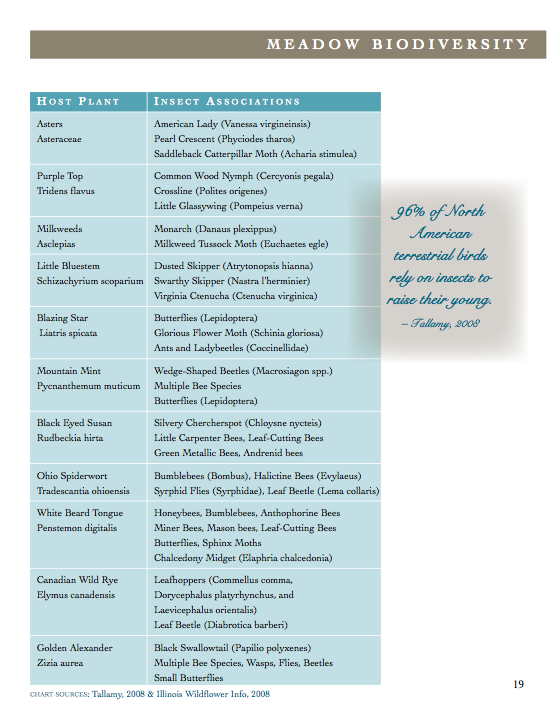 Plant plugs if using Pennsylvania Sedge and/or Appalachain Sedge. Spring—Fall: Throughout the following seasons, spot spray any emerging invasives with Rodeo®. Seasonally: Hand remove or spot spray any weeds. Plants found along the entire marina shore line include wetland, facultative wetland, and facultative upland plants which are often found in coastal plain ecosystems. Trees and shrubs found along the lake bank include Eastern Red Cedar (Juniperus virginiana), Ash (Fraxinus), Tulip Poplar (Liriodendron tulipifera), Slippery Elm (Ulmus rubra), Silver Maple (Acer saccharinum), Buttonwood (Ceonothus americanus), Alder (Alnus), Black Willow (Salix nigra), and Gray Dogwood (Cornus racemosa). Herbaceous plants along the bank include Common Milkweed (Asclepias syriaca), Goldenrod (Solidago canadensis), Lanceleaf Goldenrod (Euthamia graminifolia), Dogbane (Apocynm cannabinum), Softrush (Juncus effusus), New England Aster (Aster novae-angliae), Purple-stemmed Aster (Aster puniceus), Spotted Joe Pye Weed (Eupatorium maculatum), Arrowhead (Sagittaria latifolia), American Bur Reed (Sparganium americanum), Sweet Woodreed (Cinna arundinacea), Poverty Rush (Juncus tenuis), Marsh Purslane (Ludwigia palustris,) and Queen Anne’s Lace (Daucus carota). Unfortunately, robust populations of invasive species also populate areas of the marina. Invasives present in significant quantities include Japanese Honeysuckle (Lonicera japonica), Multiflora Rose (Rosa multiflora), Loosestrife (Lythrum alicaria), Crown Vetch (Coronilla varia), Autumn Olive (Elaeagnus umbellata), and Mulberry (Morus rubra). Many bird species inhabit the watershed, including nineteen rare breeders. In the Quakertown Swamp alone, 91 species of birds have been documented. Among the rare birds found in the watershed, sora rail and virginia rail, found within the wetland areas, are particularly noteworthy. Birds which may be lost without adequate meadow habitat include grasshopper sparrow, bobolink, northern harrier, and woodcock. There are several ways to install and maintain meadows. The management plan outlined here is designed to maximize long term viability. To do this, one must forgo flowering in the first year. At first, the meadow will look somewhat like a tall, scraggly lawn. This interim period of low growth is essential; it allows the desirable grasses and wildflowers to become established. While a lush, taller, colorful tapestry will eventually materialize, keeping the meadow low during the first year will save time and money later. Stable meadows are dominated by native perennial grasses, which suppress weeds and bind soil. 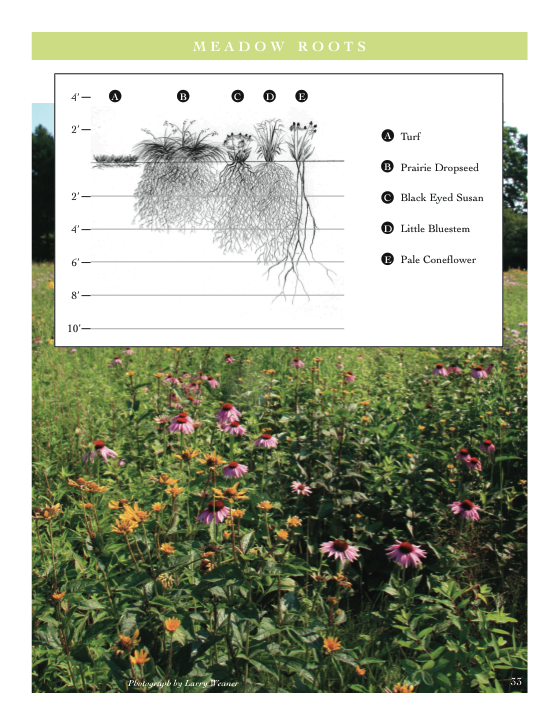 The roots of these grasses extend as deep as 8 feet into the soil, providing considerable stormwater management (see page 33). The seed mixture should be composed with a target of about 60% grasses. During the first year, the meadow should be mowed or weed whacked to a height of 6” on a monthly basis, or whenever growth reaches 10” —14” in height. This helps control the spread of nuisance annual weeds and keeps tall growth from shading the young grass and forb seedlings. Native perennial grasses, which are the backbone of the meadow, need time to become established. Neither the grasses nor the wildflowers will be harmed by the mowing. In fact, most wildflowers need two or three years of growth in order to flower, so mowing the top growth will not hurt them during this first year. Do not remove the cut plant refuse, as it returns organic matter and nutrients to the soil. The presence of specific annual grasses will help prevent erosion and provide the appropriate amount of coverage to enable the perennial grasses and forbs to root in. Mowing prevents the annual cover crop from becoming too dense. Annual grasses, also known as a nurse crop, should be selected according to the season in which the meadow is seeded. A spring seeded meadow may include Oats or Annual Ryegrass (Lolium multiflorum), while a fall or winter seeding would include Winter Wheat (Triticum). A fast growing perennial grass, Canada Wild Rye (Elymus canadensis) should also be seeded because of its ability to become established during the second year of growth, which helps stabilize the meadow. The second year is likely to yield some blooms. This is when Black Eyed Susan (Rudbeckia hirta) typically blooms profusely. This flowering plant may only persist for the first and second year, and is intentionally seeded to jump-start the visual display which will follow during successive years. The mowing schedule from this point on should occur no more than once a year, with a possibility of mowing every three years. Mowing is the most effective way to control emerging woody plants which will eventually overtake the meadow if they are not continually removed. Annual mowing or weed whacking should be done in March. This protects ground nesting birds and other wildlife which depend on meadow habitat. If mowing is scheduled too late in the spring, the ground is likely to be heavily saturated and therefore unsuitable for mowing. Meadow maintenance in the continuing years will require both the mowing schedule described above and spot spraying or hand removal of invasives. Each successive year will bring an increase in density and complexity of meadow species. 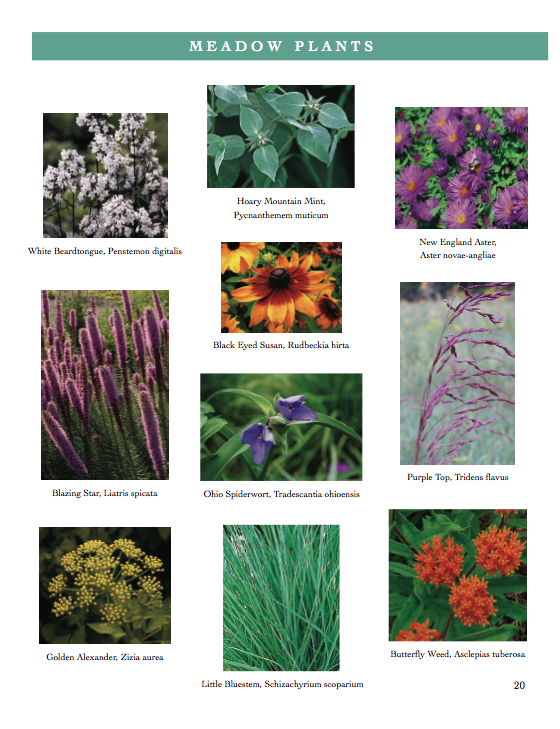 Meadow compositions also typically fluctuate somewhat from year to year, depending on moisture, temperature, and other environmental factors. The third through fifth years of the meadow are when it can be expected to appear most attractive. Information from this section is from Weaner, 2008. The water quality and ecology of Lake Nockamixon has undergone extensive study over the past 25 years. While efforts to improve water quality have been considerable, research indicates that the lake maintains high nutrient concentrations and is classified as either eutrophic or hypereutorpic. Much of the research has been initiated because of the presence and overabundance of algae within the lake. In an effort to reduce nutrient loads and sediment pollution into Lake Nockamixon, interventions have lead to substantial improvements within the watershed. In areas where farming was dominant, BMPs were implemented to reduce non-point source pollution. The dominant point-source pollutant within the watershed, the Quakertown Wastewater Treatment Plant, made improvements to its facility, which resulted in a very large reduction of phosphorus loading to the lake (Princeton Hydro & Boucher & James, 2005). Despite efforts to reduce nutrient loads, algal blooms persisted in the lake, which resulted in the listing of Lake Nockamixon as an impaired water body by the State of Pennsylvania in 1996. Because the Quakertown Wastewater Treatment Plant had already upgraded its facility, the required Total Maximum Daily Load analysis (TMDL) focused on reducing non-point source phosphorus loading. 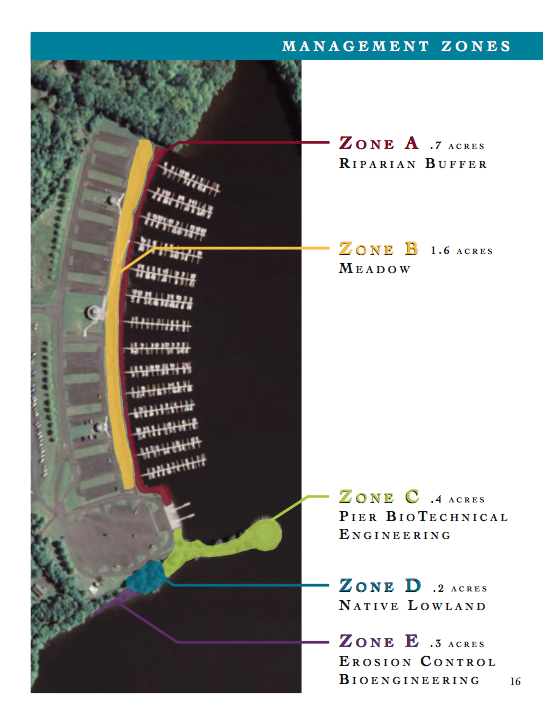 The analysis identified load reductions that would be required to move the Lake Nockamixon system from a eutrophic status to an improved status of mesotrophic (Princeton Hydro & Boucher & James, 2005). Officials of the Bucks County Conservation District continue to address water quality through BMPs enforced throughout the Tohickon Creek watershed. 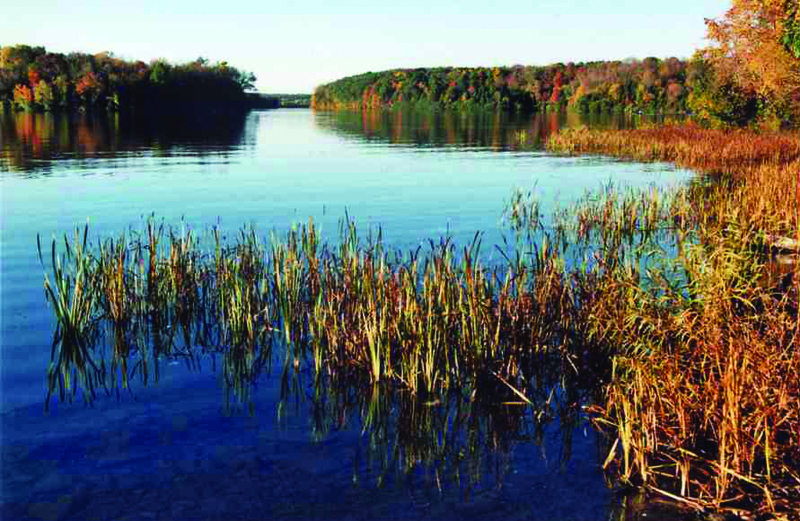 Lake Nockamixon is the largest water body in the region. Nockamixon State Park encompasses the land surrounding Lake Nockamixon, constituting one of the largest State Parks in southeastern Pennsylvania at 5,300 acres. Lake Nockamixon serves as the dividing line for the Upper Tohickon Creek watershed. All of the lands in the upper portion of this watershed drain to the lake. From the impoundment at the eastern end of the lake, water drains to the Lower Tohickon Creek watershed, which then drains to the Delaware River. Lake Nockamixon is situated in the Piedmont Upland physiographic province, which is underlain by consolidated geologic formations of Triassic age. Triassic rocks found within the watershed include either Brunswick Formation, which consists of shale and argillite, or the Lockatong Formation, which consists of siltstone and shale. While the Brunswick Formation occupies the majority of the watershed, the Lockatong Formation is found at the lower portion of the watershed. Diabase intrusions can be found throughout the northern and western portions of the watershed. Because these geologic formations have generally low- yielding groundwater aquifers, groundwater recharge is critical to stormwater management within this watershed. When stormwater infiltrates into aquifers, base flow may be maintained or increased. Stormwater infiltration may also allow for aquifer recharge, which will maintain groundwater yields. As development, and the associated increase in impervious surfaces, is expected to increase around the upper portions of the Tohickon Creek watershed, it is important to manage stormwater runoff as wisely as possible (Bucks County Planning Commission, 1996). The topography of the area is typically flat to gently rolling hills. Prominent ridges and mountains occur where diabase intrusions exist in the northern portion of the watershed. The area is characterized by extensive areas of contiguous forests, hills and ridges, gently sloping valleys and plateaus, state and county park lands, farmland, extensive areas of isolated wetlands and several notable aquatic habitats including Quakertown Swamp, Lake Nockamixon, and Lake Towhee (Princeton Hydro & Boucher & James, 2005). Absence of lakes and ponds is the result of absence of glacial activity within the region over recent geologic time. It is for this reason that the standing water bodies within the watershed are the result of human activity. functioning lawn alternative to marina visitors. 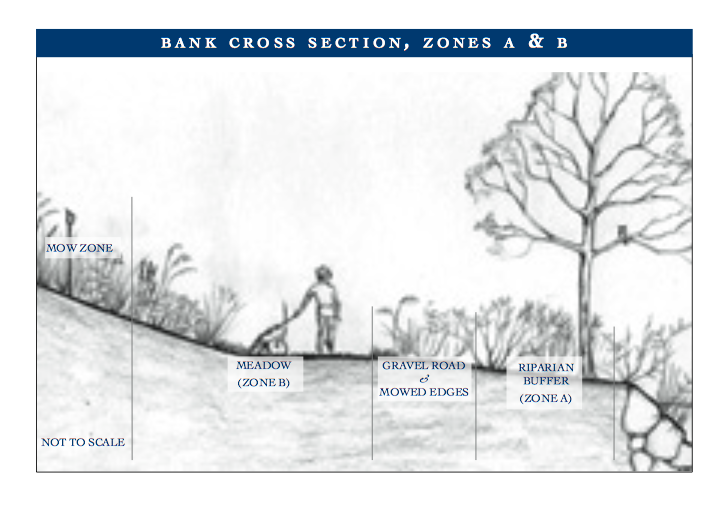 the meadow and riparian buffer in ZONES A and B would look. acceptable level of care (Nassauer, 1995). control over high priority areas.